Generally, I share guest posts on Friday but I’ll just be honest and say that I am a little behind in that department. There will be more of those coming but for this week I decided to finish a post of my own that I have been wanting to share for some time. It also goes along well with last week’s guest post from my friend Lola on being a Doula and with my friend Beth, at Red and Honey, who is doing a book giveaway (check out the last link at the bottom). Although I strongly believe that caesareans happen far more regularly than they need to, there are times when they are needed for a healthy baby and/or mama. I for one am thankful that Cecily and I had that available to us as had we not, her birth would not have resulted in life. My sharing all of this is not actually to debate the relevance of caesarean births or the overuse of them but is actually to share a few things that I think are vitally important when having a caesarean. Especially if you are strongly for birthing naturally (home, hospital, unassisted, drug-free, intervention free; however natural looks to you), you might not even prepare for the case of a caesarean. Antibiotics: You will be given antibiotics via IV during your caesarean; as far as I know there is no way around it. If you have a scheduled caesarean, I would really suggest beginning a good probiotic at least several days prior and continue it for a few weeks afterwards. If your c-section is unplanned, ask to be prescribed and immediately begin a probiotic to regain “good bacteria” in your gut flora. – Use your own baby blanket and hat (I don’t use clothes the first few days really). Also have receiving blankets for them to be cleaned up with. I had planned this for the baby’s birth regardless and so had been sleeping with a baby blanket and hat to insure that it had my bacteria. Kathleen was wrapped in this rather than the hospital blankets. – Start your baby on an infant probiotic immediately. I wasn’t prepared for this and so wasn’t able to start her for a few days, but I wish that I had had it to begin using immediately. I also didn’t think to ask for a prescription for one temporarily while in the hospital unfortunately. – It is also possible to use vaginal excretions (swabbed prior to antibiotics) to swab the baby. 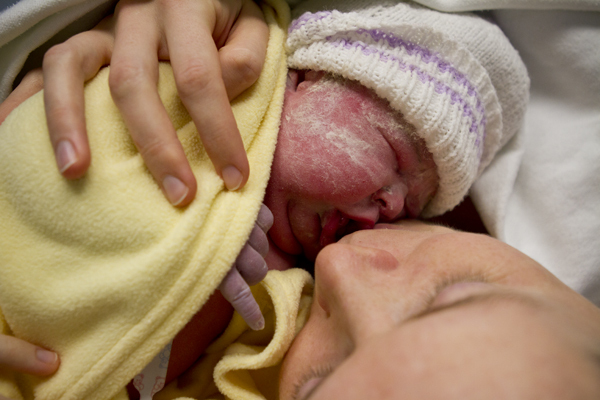 That may seem strange and gross, but think about what happens in a natural birth. – Breast feed as soon as possible. 5. Bonding: This is the area that I felt very, very strongly about and the one that is easy to miss out on. – Ask to be given your baby immediately. Go skin to skin. Unless the baby is actually in distress there is no reason for the cleaning, weighing, etc. to happen right away. Your baby needs you, even premature babies. Even though many hospitals still have the policy of observing premature babies separate from their mamas there is solid research done that in most cases, they tend to thrive when skin to skin with the mama. I chose to wait to breast feed for close to an hour, even though both Kathleen and Cecily tried to immediately, due to the drugs in my system. I might do that differently now. – Have your baby remain with you while you are being stitched, I discovered that this isn’t standard but very possible and again generally, there is no reason not to. – Consider having your baby with you in recovery. I didn’t push for this with Cecily because she was premature but I would now. Kathleen was with Dan in Kangaroo Care for a time before she joined me in recovery. I wanted to keep her with me the whole time but because of my reaction to the epidural was going in and out of consciousness (I don’t think this is common). – If it is not possible for baby to be with you the entire time, make sure they are enjoying skin to skin bonding with their daddy or whoever is present with you at the birth. – In case of a general anesthetic (being unconscious): It is still very possible to have contact with your baby. You may not be aware, but they will be. This is more complicated and as I didn’t end up doing a general anesthetic, I can’t tell you in practice how it works. Especially if you have a mid-wife, they will be present in OR and you can plan for them make sure that this happens. 7. Don’t Stress: It was so easy for me to get really tense and worried that everything wouldn’t be done exactly as I wanted and to feel like it was me against them. Sometimes that is how it went. For example, the nurses didn’t undertand that I wanted Kathleen to be cleaned up with our own blankets, so used theirs and wrapped her in what I had given them. Some details are worth a fuss, others maybe not so much and you need do decide that keeping in mind that it is a bit of a flurry with neither you or your spouse thinking totally clearly. That’s okay and it doesn’t give you a bad mommy award. http://jn.nutrition.org/content/138/9/1796S.full A study on Intestinal Bacteria in Cesarean and Vaginal Births. 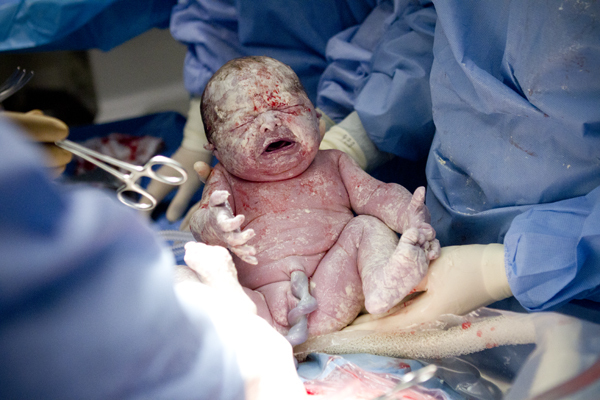 http://womantowomancbe.wordpress.com/2010/05/30/skin-to-skin-in-the-o-r-after-a-c-section/ Skin to Skin in the OR. It includes a beautiful video. 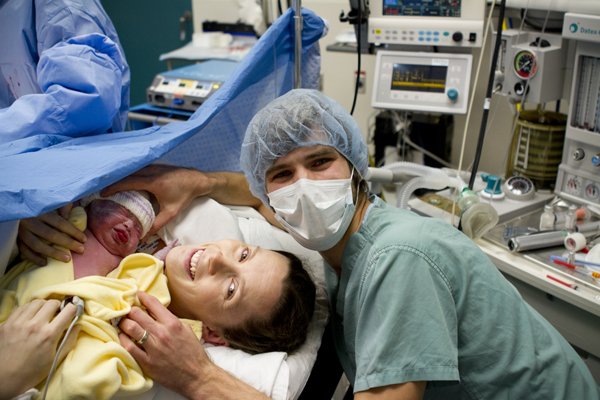 http://wellroundedbirthprep.blogspot.ca/2011/02/how-to-have-natural-cesarean.html An Article full of links on how to have a “natural cesarean”. I’ve not read all of them but liked the ones that I did read. http://pregnancy.about.com/cs/laborbirth/a/aa042300a.htm a brief explanation for why labor prior to cesarean is good. http://redandhoney.com/2012/05/unbound-birth-how-to-have-a-natural-birth-in-the-hospital-review-giveaway/ My friend Beth is offering a book giveaway and review on a book called Unbound Birth: How to have a natural birth in the hospital. I personally haven’t read it but I trust her judgment that it is worth a read. Do you have any other thoughts or links to add? What went well for you during a cesarean and are there things that did not go as you would have liked? I have missed any points to consider? Have you or do you include the possibility of a cesarean in your birth planning? I am so glad that you found it helpful, Katherine. I think it is easy to look back and wish that you had known more, I know that I do but I guess I just choose to keep learning and moving forward. And try to share things that I learn. For the probiotic, I would get the 120 pack as that would give you four a day for a few weeks. I think they may actually be cheaper on amazon but not sure about that. If you don’t have a probiotic when you have the baby you can ask to be prescribed one and you can ask for one called Bio-Gia…you can both take it in drop form. I don’t think it is as effective from what I know( haven’t read extensively) but it does work and would usually be covered while in hospital. I worried until my 32 week ultrasound about having a c-section,my placenta was also low but I was lucky and it pulled up. I was so incredibly fearful of having one, more then any other fear about the birth process. I am looking forward to meeting her…and you! With complete placenta previa, the stats of it moving up are not good. I spent way too much time researching to see if there was some way to have it move but there was no budging it. Mostly I just kept it to myself how upsetting it was to have a c-section because the typical response is just to be thankful for a healthy baby which I was but it felt as if my body and I had failed. So I totally get the determination to not even plan for a c-section:). I am jealous, I had wanted a home birth the last two babies! I think even “emergency” c-sections are pretty varied in how they happen (i.e. with my second, she needed to come out as quickly as possible to prevent too much blood loss and was quite premature, so my choices were a little more limited and there wasn’t as much to time to argue. Whereas with my last baby, I had several hours to discuss and think and time to share what I wanted and didn’t want.) It’s still no where close to my ideal, but I very much still felt that I was maintaining the responsibility that I needed for my child and myself. As I mentioned in another comment, I didn’t think about an emergency plan much with my first, I almost had this idea that if I did, I was asking for it to happen. I don’t think that even now I would spend overly much time focussing on it but I do think it is good to have some basic plans in place as it can be much harder to think clearly in the moment. Well, I loved this. I am completely for all of these things and wish more women knew what was in their rights to have. It’s sad what we are subjected to when we dont think we have choices. I LOVE that you wrote this and if I knew any preggo women besides the ones here I would pass this on. LOVED this and I am sooooo glad you wrote it. On more silly question..what do you mean by swab? I am picturing q tips and probiotic paste…does that actually work well and seep in fast? Not sure what you meant by that. I just loaded up on probiotics in my diet prior to… Great ideas!